Of all the small forts scattered around the Palghar region, Asheri can be termed as the �Elder Brother� due to massiveness of it's size and height. As it covers a huge area the fort looks impressively strong. History mentions that Bhojraj, a descendant of the Shilahar Dynasty built this fort. Hence it can be assumed that this fort is at least 800 years old. The Portuguese rebuilt this fort after they captured it during their rule. In 1737, Peshwa won this fort during his campaign of the Konkan and in 1818 this fort came under the British rule. On the plains and on the right of the path one can see quite many remnants of settlements. One can also see quite many foundations with gutters cut in them. These could be to collect the rainwater during the rainy season or to lead away the overflow. The cave on the top is of medium size and having a large cave opening. But it has been carved into the rocks in such a way that the stray wind or the cold does not enter in. The back portion of the cave is very uneven. However, there are platforms made both outside and inside for the guards to take rest. The two hibiscus bushes outside the cave entrance point to the fact that rituals might have been conducted regularly by the villagers somewhere in the past. On left side of the top portion of the cave, there is a built in square water tank. There is a half buried cannon in this tank. There are two more half completed tanks here. From the top plateau, one can see the fort of Kohoj to the South West. One can also see the natural human form on the fort with the help of binoculars. Going ahead on the path one can see a huge depression the rock face and a bastion. There is only one route going to the top of the fort. One has to get down at Khodkona village bus stop. This village is reachable either by the S.T. from Palghar to Kasa or by private vehicles plying this highway. This village is situated around 10-11 kms ahead of �Mastan Naka�. The actual village is situated a bit inside from the main road. There is a bullock cart route to the left of the highway, which leads to the village. 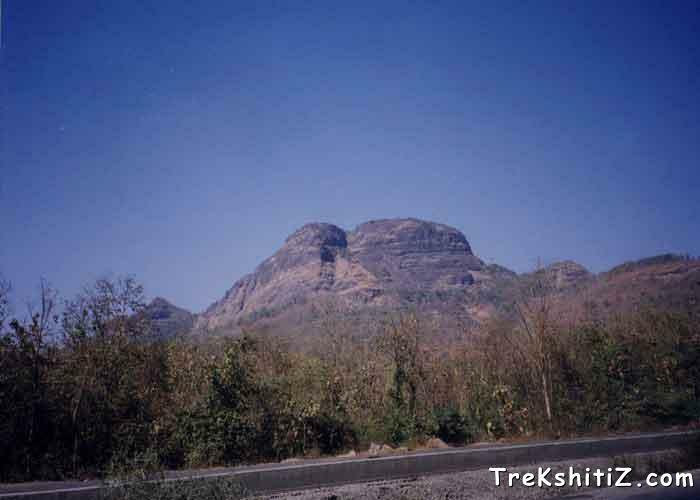 On the highway, if one stands with his back to Palghar, one can see Adsul to the right and the vast expanse of Asher to the left. The bullock cart route enters the village via a small bridge. Here, the small beautiful temple of Vagdev can be seen. On entering the village we see the vast expanse of fields, cultivation of mango trees and houses peeking from the greenery, which drives away the tiredness of the journey . After quenching the thirst and filling bottles with the cool well water, one should proceed ahead towards the fort, on the route shown by the villagers. As the route goes through dense jungle, one does not feel the heat even in the summer. It takes approximately 1 to 1 � hours to reach the pass. The route up to the pass is easy but continuously climbing. There is a temple of Vagdev a bit ahead of this pass on a higher level. One should turn to right and proceed towards the top of the fort. We reach the base of the entrance as we go around a huge rock face in the route. Here one can find a small sculpture of Ganesh on the rock face. The entrance has been destroyed by explosives. Here, care must be taken while climbing up. As the climb is quite zigzag and steep, it is advisable to take help from someone Expert in climbing. If possible, climb without any sacks on your back. After exhausting enthusiasm to climb, we reach a flight of steps cut into the rock face to the right. There are quite many water tanks on the way, but are not potable. From this water tank, we can reach the middle of the fort making way through the shoulder length bushes growing here. To the left, below the route are 5 water tanks excavated into the rocky ground. Of these one tank has potable water. Walking ahead, after 5 minutes, another path bifurcates to the left. Going down this route, we come across three more water tanks. The water in these tanks is very clear, sweet and thirst quenching. There is also a cave on the rock face nearby on right hand side. Around 10-12 trekkers can stay in the temple and the plinth built outside. However, foodstuffs should be taken care of from mice. Water is available all through the year. Difficulty gradeis hard because the rock climbing part of the climb is bit tough and can be dangerous during the monsoon. It is adviced that this should be tried with the help of experienced trekkers only.